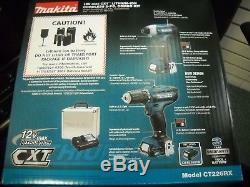 Listing is for a brand new in the box Makita CT226RX 12-Volt MAX CXT Lithium-Ion Cordless 2-Piece Combo Kit Metal Case. 3/8 Driver-Drill with 2-speeds (0-450 & 0-1,700 RPM) delivers up to 250 in. Impact Driver with variable speed (0-2,600 RPM & 0-3,500 IPM) up to 970 in. Ergonomically designed handles with rubberized soft grips provide increased comfort. 12V max CXT slide battery design enables tool to stand for convenience. Includes - FD05Z, DT03Z, (2) 12V max CXT Lithium-ion batteries, charger, tool case. 3/8" Driver-Drill features a compact design at only 7-7/16" long and weighs only 2.4 lbs. With battery for reduced operator fatigue. Impact Driver with variable speed (0-2,600 RPM & 0-3,500 IPM) delivers up to 970 in. Impact Driver features a compact design at only 6 long and weighs only 2.3 lbs. 12V slide battery design enables tool to stand for convenience. 12V Compact Lithium-Ion 2.0Ah battery BL1021B features an integrated L. Light illuminates the work area. Part of the expanding 12V max CXT series, combining performance with superior ergonomics in a compact size. Not compatible with 12V max pod-style tools, batteries and chargers. (1) 12V max CXT 3/8 Driver-Drill (FD05Z). 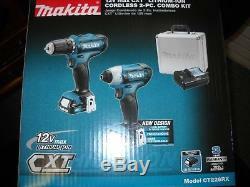 (1) 12V max CXT Impact Driver (DT03Z). (2) 12V max CXT Lithium-Ion 2.0Ah Battery (BL1021B). (1) 12V max CXT Lithium-Ion Charger (DC10WD). The item "Makita CT226RX 12-Volt MAX CXT Lithium-Ion Cordless 2-Piece Combo Kit Metal Case" is in sale since Monday, March 05, 2018. This item is in the category "Home & Garden\Tools\Power Tools\Combination Sets". The seller is "scenterprises4408" and is located in Atlanta, Georgia. This item can be shipped to United States, Canada, United Kingdom, Denmark, Romania, Slovakia, Bulgaria, Czech republic, Finland, Hungary, Latvia, Lithuania, Malta, Estonia, Australia, Greece, Portugal, Cyprus, Slovenia, Japan, China, Sweden, South Korea, Indonesia, Taiwan, South africa, Thailand, Belgium, France, Hong Kong, Ireland, Netherlands, Poland, Spain, Italy, Germany, Austria, Russian federation, Israel, Mexico, New Zealand, Philippines, Singapore, Switzerland, Norway, Saudi arabia, Ukraine, United arab emirates, Qatar, Kuwait, Bahrain, Croatia, Malaysia, Chile, Colombia, Costa rica, Dominican republic, Panama, Trinidad and tobago, Guatemala, El salvador, Honduras, Jamaica.